Creating and managing Email accounts in Kazeli is quick and easy. Follow the steps below to create and setup new Email accounts for any User Account in your Kazeli system. From the domain list, CLICK ON THE DOMAIN you would like to add an email address to. By default all domains have an admin@yourdomain.com account already setup. Fill in required fields and select the user account you would like to receive the emails from. Once done, make sure you setup an SPF Record for your domain to ensure high deliverability when sending from Kazeli. 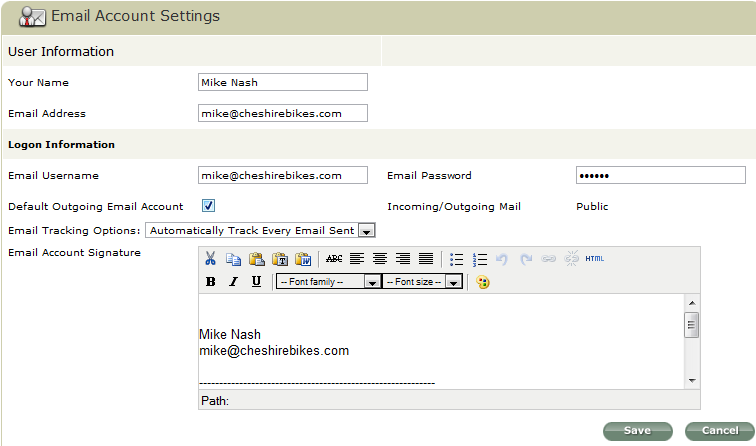 Now that your email is setup you can login with that user account and start sending and receiving emails. You will notice that when you are composing a new email, the new email address is automatically added to the drop down menu of possible email addresses to send from. Under the Kazeli Account & Permissions section, click the EDIT button next to the User Account you would like to edit. Under Email Account Settings, click the EDIT link next to the email address you would like to make as default. Click the checkbox DEFAULT OUTGOING EMAIL ACCOUNT and click SAVE. You will still have the ability to send from any email account that’s pointing to your User Account, but now by default you will always be sending from the Default you have specified.